City X-Ray & Scan Clinic offers complete range of diagnostic investigations along with variety of amenities to make you feel as comfortable as possible. We have two main branches in Tilak Nagar and Vikas Puri and 5 other main satellite centers in West Delhi. The unique concept of high class diagnostic services of imaging and laboratory facilities are appreciated both by doctors and patients. The facilities are upgraded and are diversified on regular basis. To use multi disciplinary approach with ethical practices by a team of highly responsive, caring and efficient professionals with a constant focus on excellence in delivering best medical services in patient care, continuous up gradation of services, best and accurate reporting and to deliver benchmark quality in Diagnostics. 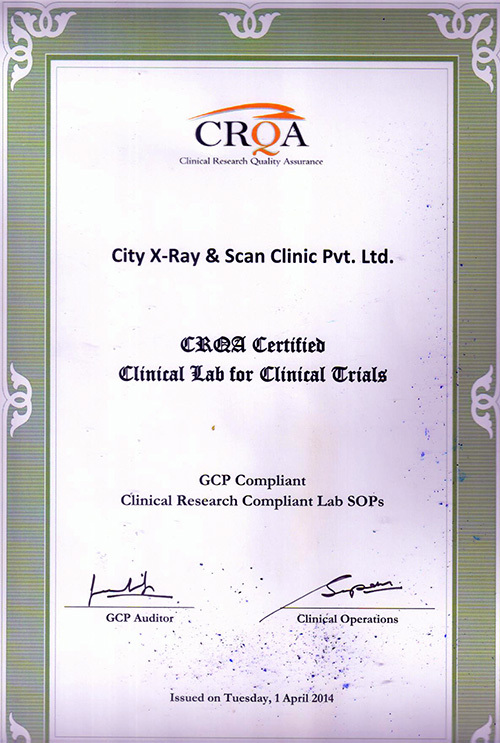 City X Ray has been established with a mission to provide world class affordable and best diagnostic facilities to all sections of the society irrespective of caste, colour and creed with a humanitarian touch, while maintaining high standards of ethical practices and professional competency with emphasis on training and grooming of staff. We aim to have Pan India presence and to become the most preferred diagnostic facility. 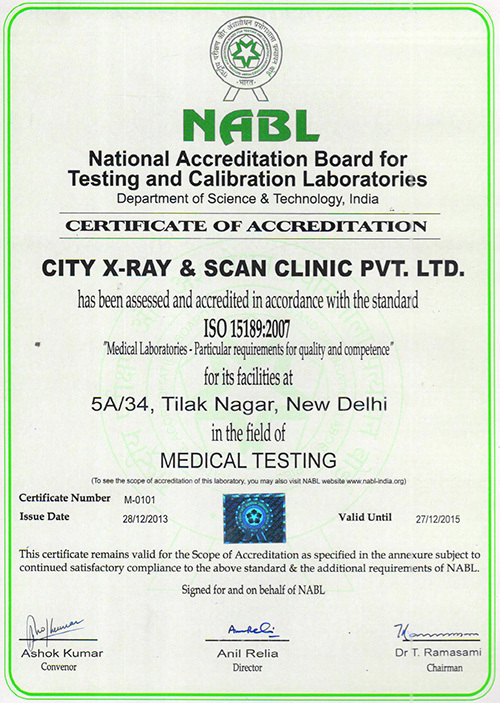 City X-Ray holds the NABL Accreditation for Laboratory and NABH Accreditation for Radiology, Cardiology and Neurology where regular & proper implementation of MIS systems and standards is maintained under the expert guidance of full time Pathologists, Microbiologist, Radiologist, Anesthetist, Quality Manager & RSO. Our website www.cityxrayclinic.com provides the facility to access the Reports online. Unique ID and Password is available on each receipt to access the reports. Hospitals and nursing homes can also view the reports online of the samples sent to our lab. Our state of the art diagnostic facility is equipped with the most advanced and high end equipments which deliver the best results at lesser time and gives the confidence of correct reporting to our doctors. City X-Ray has total 10 well-maintained ambulances. Drivers are imparted training in patient care to be followed in the case of serious patients. City X-Ray provides best diagnostic facilities to all sections of society at doorstep irrespective of caste, color, and creed with a humanitarian touch, while maintaining high standards of ethical practices and professional competency with emphasis on training and grooming of staff. We ensure delivery of Quality care with highest level of expertise from medical experts. We work in synchronization with the referring physician to make sure that they get timely reports in the preferred formats so that the patients can be treated in the most efficient manner. Our team of efficient staff and patient care executives provide the best services in a compassionate manner. They are regularly imparted training regarding patient handling and soft spoken skills. City X-Ray provides the vast range of investigations under one roof from HB to MRI and all rare investigations are performed by Senior Consultants. Life member of Janakpuri and associate Life member of Westown & outer west branch of DMA. Life member of IAPM, APP, ACBI, ISHTM. Regularly monitored by stringent Quality Controls (Internal & External) & Calibration. Supervised by team of full time Pathologists, Microbiologist, Quality Manager & Technical Heads. All clinical trial team members are ICH GCP Trained & Certified , Trained on 21 CFR Part 11, Trained on SOPs, Expertise in validation of new markers, Understanding of clinical trials business, ability to customise your needs.